A few days ago I pushed the “send” button to email the manuscript of my latest book to a typesetter at the University of Chicago Press. More precisely, it was Richard Allen, an editor associated with the press, who pushed the “send” button, and the next stage is not “typesetting” in the mechanical sense but the process of transforming digital files into printed pages along with supporting materials such as table of contents, index, illustrations, notes, and so forth. The fact that our everyday words do not fit the reality of what we are doing is one of the themes of the work (which will appear as a book in the fall). Its overarching theme is that we have no name for the biggest historical story of our time mainly because it is so big. It is not so much an event as a change in the conditions of history, as the world in which we act is now so largely created by our own actions. Although we do not control our surroundings, we dominate them with an intensity, reach, and acceleration utterly beyond anything known in the past. To bracket this off as “environmental” or “technological” history is to miss the point that we live in a new historical condition and that we still lack language to describe it properly. 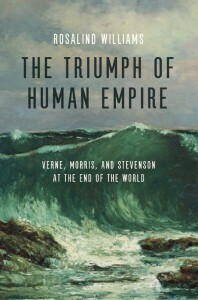 I try to begin to do this with the title of my new book, The Triumph of Human Empire. You will find a longer description of it under “Writing,” which will also give you an idea of how this book fits in with other work I have done. Now available from the University of Chicago Press.